I think this is my best work so far (until recently), and many people agreed. Traffic has been great on Miss Fury for a long time. After over six months, I still get Miss Fury fans and people new to her work rumaging through my pages. This was also a response to the lousy way they butched Tarpe Mills’ creation over at Dynamite. I heard an interview with the young writer of that had he stunk of “fake it until you make it” in the entire interview. I like my version because its filled with love and respect for what Tarpe Mills achieved. We need – More Women In Action Comics, and we need it right now. I have always been fascinated by Black Fury/Miss Fury, a golden age female action hero created by a woman – the first woman to write and draw her own strip. She did Miss Fury for about 10 years for the Sunday Funnies – those wonderfully big pages where you get just one big page a week of story. On the Copyright Office application for my work, I credited the public domain work of Tarpe Mills for design and story (plot points). I tried to always keep a half Tarpe, half me feel to it. 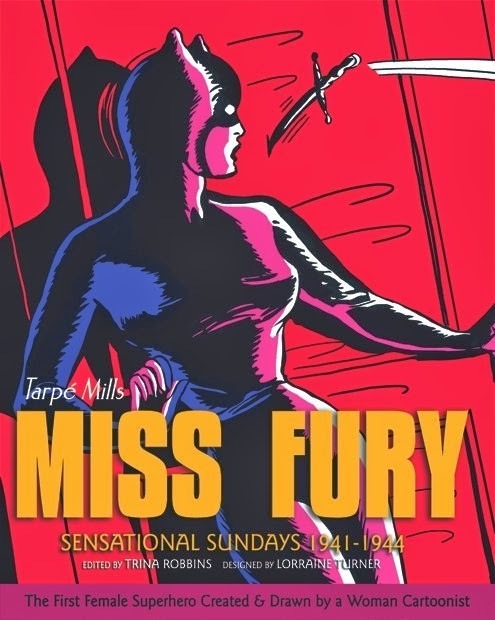 I encourage eveyone to pick up Miss Fury Sensational Sundays (by Tarpe Mills), 1941-1944, edited by Trina Robbins. My story, however, is an odd, almost European sad lyrical take on the tough realities of domestic abuse. I like this one a lot. This is where my pages really stepped up a few notches. The pictures worked so well I dropped gratuitous dialog, making much of it silent. 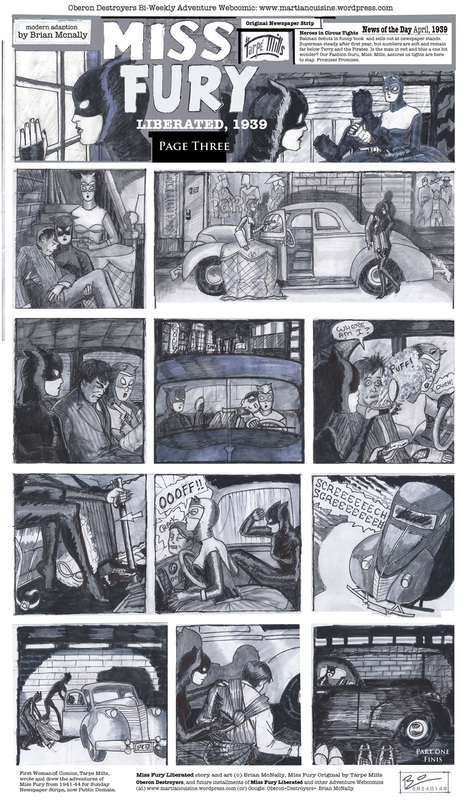 These are the three pages I put out, all one story – these are 11×17 jpegs, so clicking to enlarge is highly encouraged to get the full “Imax” effect. I wonder sometimes if people were surprised by Miss Fury Page 3. I wrote the dialog, and it was all ready to go but… we heard it before. “You beat up my man how could you, You have no idea how much me means to me, I can change him, blah blah blah blah.” You heard it before. I thought the whole page was more eloquent just silent, especially since the pictures so effectively tell a weird story that is strangely easy to follow. About half the panels were drawn freehand from the Tarpe Mills original with variations, and half are original panels by me. Fifty fifty – I love Tarpe Mills, so all must be 50-50. I liked doing these a lot, but they can be time consuming to draw and “color.” (I used six gray markers of different shades). Click to enlarge. Total size is 1000 pixels wide, or 11×17″. 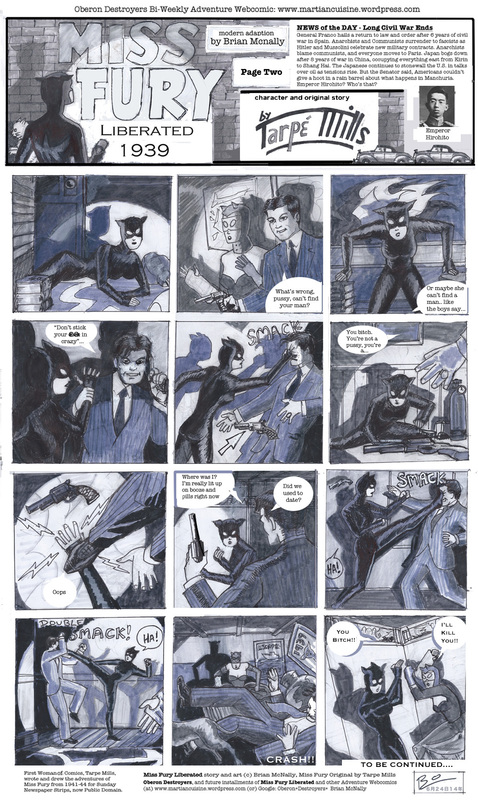 I encourge people to pick up a collection of Tarpe Mills work – Miss Fury by Tarpe Mills: Sensational Sunday’s (1941-44) edit by Trina Robbins. Tarpe Mills’ color work in the book is really gorgeous – done with just four color separations for the printer – amazing work. The second half explodes in rich red tones everywhere. Well worth the cover price!